"VCR VHS Cassette to DVD Conversion" is a quality brand in Video and Audio Cassette Tape conversion service in South India serving at lowest possible prices in the market. 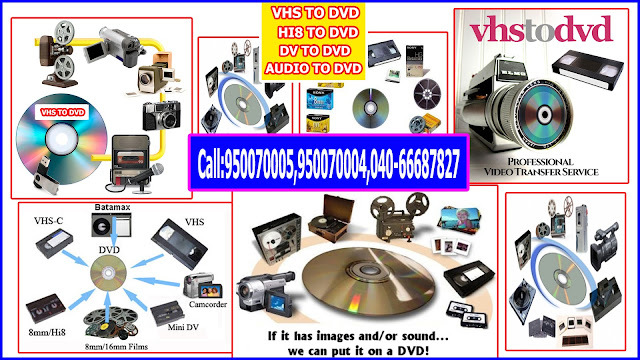 Currently, we are offering Hyderabad, the best professional quality Digital Conversion of all types of Video Cassettes and Audio Cassettes at lowest prices with personalized customer support. Supported Video Cassette Formats VHS Cassette (VCR) VHS-C Cassette Hi8, Video8 Cassettes Mini DV Cassettes Audio Cassette Conversions We can also repair the damaged cassettes and restore them. Feel free to contact us. Note: We convert only home videos. We do not convert copyrighted content." Call: 950070005, 950070004, 040 - 66687827.